In large bowl, beat dry pudding mix and milk with whisk 2 minutes. Stir in cake mix, carrots, cinnamon, cloves and nutmeg. Spread batter evenly in pan. In large bowl, beat cream cheese and softened butter with electric mixer on medium speed 1 to 2 minutes, scraping bowl occasionally, until smooth and creamy. Beat in vanilla and powdered sugar until combined. Spread frosting evenly over top of cooled cake. Sprinkle top with pecans. 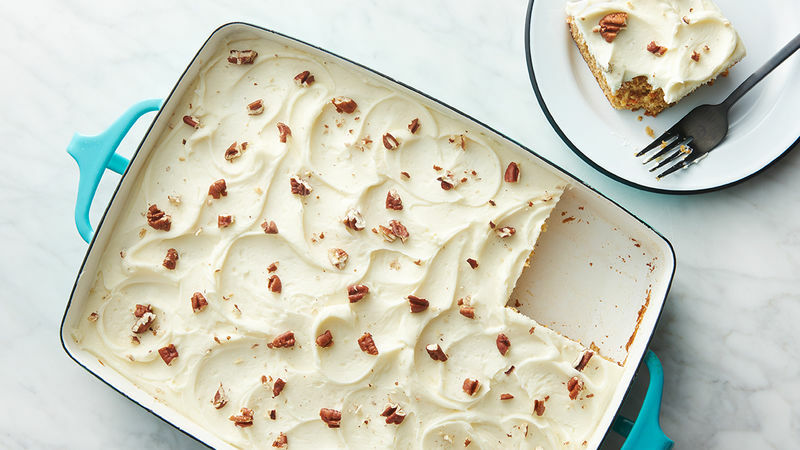 Swap homemade cream cheese frosting for Betty Crocker™ Rich & Creamy™ cream cheese frosting, if desired. Those impressive sky-high carrot cakes with layers upon layers of cream cheese frosting are undoubtedly gorgeous, but you might as well clear a full weekend for the time it takes to prepare one. While we’re all about beautiful cakes, if it’s that carrot cake flavor that you’re really after, skip the fuss and whip up this dump-style carrot cake. All the components of your fancy carrot cake are here: ground cinnamon, cloves and nutmeg deliver the spice and warmth we love and a moist cake is pretty much inevitable given the vanilla pudding mix that’s added to cake mix. And obviously carrot cake isn’t carrot cake without the rich creamy cheese frosting, so we made sure to include a homemade recipe for that. You won’t believe how easy it is to make your own cream cheese frosting or any other frosting for a cake.